RORO stands for Roll On, Roll OFF. It is a brilliant concept executed by Konkan Railway. I had heard about this earlier but hadn’t seen in person. This week I got to see them in action. This post shares few pics of this unique idea and the benefits and need for introducing such system everywhere else in India. While transportation of cargo (freight) by train is fast and cheap, at times it is not convenient. 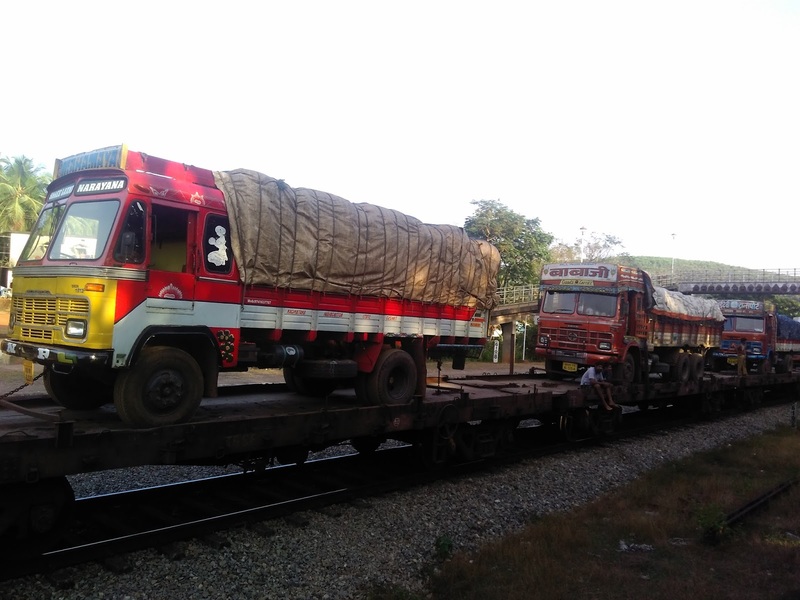 Cargo needs to be loaded on truck, taken to railway yard, unload and load to a cargo container and repeat the process at destination to take the goods to final destination. Loading & unloading is done using manual labour and takes several hours per truck, which is time consuming and costs money. Another option was to load it on the truck at origin (say a factory in Mangaluru), drive the truck to destination city (Say Mumbai) and drive it to final destination of the consignee (party who wanted the goods). Driving a truck long distance is a costly affair- lots of money is to be spent on diesels, tyres wear out due to bad roads, other vehicle parts may break down or need replacement faster, drivers face fatigue driving continuously and face risk of accidents. Add to this huge tolls that need to be paid and other permit fees. So why not marry truck+Train system and extract the best of both worlds? 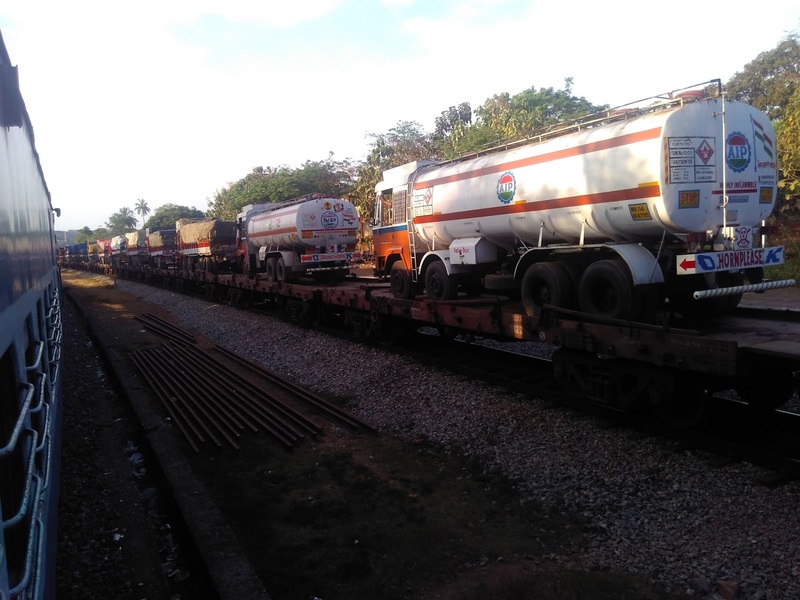 Instead of unloading cargo from truck on to train, simply keep the entire truck on the railway carriage. At the destination, truck can be driven off the train and driven straight to final destination. That is RORO for you. Roll ON, be taken to destination city on train, then roll off, drive on. Of Course Railways will charge a fee for this service. But as long as that fee is less than cost of fuel+toll otherwise incurred in driving all the way, it is a win-win deal for both railways and truck owners. Full savings on fuel, toll fee, inter-state permit fee and other daylight robbery usually done on the roads. Cost of RORO- from what I read, moving a truck (up to 15 MT) between Mangalore (Suratkal) and Kolad (150 kms from Mumbai) costs about Rs 8000. Which is very competitive. (Rs 10 per km approx- a truck usually moves 3km per litre of diesel, which is Rs 50 per litre or Rs 16 per km), so RORO is outright economical. All other savings like toll etc extra. As far as I can see RORO is a rocking success. Indian Railways need to adapt this idea everywhere else and should open it up for passenger vehicles as well. It will take load off the road network, reduce accidents. For example, if RORO is introduced between Bengaluru n Chennai, one can book a slot on the train, drive their car on to the railway compartment, sleep in the car, get up fresh after about 5 hours, roll off the carriage someone on the outskirts of Bengaluru and reach their destination. - At present toll companies have monopoly and are increasing toll at will every now and then. If vehicle owners have an alternative option (RORO) then it will increase competition and will keep toll rates in check. - For a petrol hatch, going to Bangalore by road means about Rs 1300 worth petrol (assuming fuel economy of 18-20kmpl) plus Rs 400 in toll (one way). Driver fatigue, wear n tear etc extra. If railways can charge less than Rs 1500 then it is great deal for vehicle owners. - Safety will be a concern if opened to passenger vehicles- people may risk their lives trying to take selfie or leaning over the edge of carriage etc. So carriages will need proper boundary or there should be some sleeper coaches in which passengers of vehicles can sleep. If they can do it for passenger car that will be great. I want to travel in own car but that's not feasible for North Indian states. This will be amazing option. True. We can take train to Guwahati and explore north east and come back,.. It is a very popular concept in Europe am happy India is picking up...has great advantages as cited by you. I had seen this 3 years back, but didn't take much interest on this topic. Its very enlightening to read your detailed analysis and views! carriages need boundary for people to take selfies -overzealous.I think predominantly first it would be great if vehicle drivers for starts follow road rules on the road forget about roll on carriers for passenger vehicles. I think it needs a lot of disciple which is lacking to make it successs. If you see in pics, there is no side walls in the carriage carrying trucks- which is fine with only driver and cleaner who are used to this. And hope you will agree that additional safety measures (like side barriers) are needed if passengers are to be allowed. @CM- Yes, highways are very narrow in Kerala. If they extend it till Trivandrum, even TN can benefit a bit. Awesome! And given the state most of our highways are in currently, it makes so much sense. They might be two different things but the point i am trying to make is discpline both on the road and on the RORO ,if you dont follow rules it doesnt make sense to setup a system since it will defeat the very purpose of setting it up. Not that the Indian railways is going great guns but even when it does ,they will thing about RORO for public 100 times over simply because of the risks involved which you have quoted. When the lorry drivers can follow it why not future car drivers ,its all down to commonsense and following the rules.If its made for cars then there might be perhaps a seperate bogie for passengers or alternatively sit tight inside your cars like the lorry drivers. Sorry to sound a bit cynical ,you often quote authorities to make things safer ,but when you dont follow existing rules made by them ,you are basically asking them to make more rules so that you can leverage existing rules ? @The Wild: Fully agree. But my point is- some people not following rules is not a justification for NOT providing a unique facility to entire public. An additional sleeper coaches for passengers will be great value add. This is best and most efficient idea. Currently Indian railways carrying competition about new idea to deal with innovation. Up to 20 Feb 2017 . Wish to give some idea to them and helpful for all our transportation industry. @hemant- can you share competition details here?